At the moment, I’m hearing a whole bunch of traffic around 14.074 MHz in a digital mode that I don’t recognize. I haven’t been able to get intelligible text out of fldigi from this yet. From the amount of traffic, I wonder if this might be some sort of contest activity. Can anybody provide a hint about what this mode is? This weekend, I gave The Orange Dragon a much-needed upgrade: a nice, big rear-view mirror. My new Kubota L3301HST tractor’s loader valve developed a couple of minor (and as it turns out, related) issues. The fix was very easy. I discovered an issue with the alignment between the backhoe and its subframe on my tractor, which is getting it a free vacation at the dealer’s shop so they can take a look at it. I’ve also made a simple little upgrade to the implement height adjust lever stop. The Orange Dragon has Arrived! 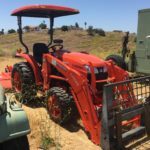 The newest member of my motor pool is a brand new Kubota L3301HST tractor. Say hello to The Orange Dragon! I bought this neat little piece of test equipment in an online Goodwill auction. Not much military surplus electronic equipment shows up there, but every now and then something cool pops up. My first computer was a Radio Shack TRS-80 Color Computer which my dad bought for Christmas in 1981. With a built-in RF modulator, it plugged into an antenna switch box mounted on the family color TV. That old Magnavox TV is long gone, but I still have that Color Computer. A “holy grail” that I seek for my collection is one of the Radio Shack color televisions which were featured in advertisements for the Color Computer. There are two that I’m looking for. After fixing the failed extruder thermistor on my Monoprice Select Mini 3D Printer, it didn’t surprise me at all when the heated bed thermistor also failed. Read on to see how I replaced it. I replaced the broken thermocouple in my MP Select Mini 3D Printer this weekend, and it’s back up and running again! Here’s how I did it. I’ve measured the resistance vs. temperature of the thermistor in my MP Select Mini 3D printer. It looks like the thermistors that I speculatively ordered don’t have the exact same temperature curve, but they may be close enough to use my printer with a manual adjustment of the temperature set points to compensate for sensor error. Monoprice Select Mini 3D Printer: Growing Pains!